A letter written by John M. Cain, late Captain Co. G and formerly 1st Lieutenant Co. B, 83rd US Colored Infantry, late 2nd Kansas Colored Infantry, Atchison, Kansas, dated March 12, 1866, to Charles L. Mosley, McFall, Gentry County, Missouri. 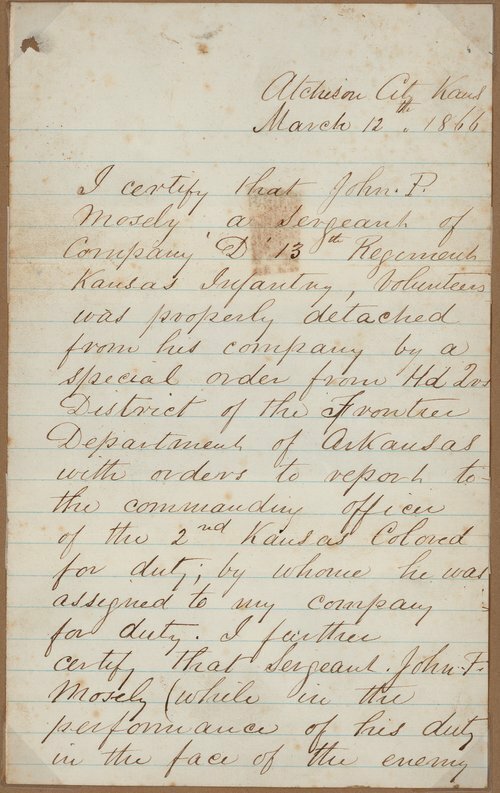 The letter reports the death of Sergeant John P. Mosley, who was a member of Company D, 13th Regiment Kansas Volunteers and later assigned to duty with the 2nd Kansas Colored Infantry. When Mosley entered the military on August 21, 1862, he was 22 years old, married, a resident of Atchison, Kansas, and employed as a blacksmith. He was promoted to corporal on September 29, 1862, and sergeant on September 1, 1863. On November 16, 1863, Mosley was assigned to the 2nd Kansas Colored Volunteers. While serving with the 2nd Kansas Colored, he was wounded, left on the field, and taken prisoner by the Confederates at the Battle of Jenkin's Ferry, Arkansas. Mosley died at Princeton, Arkansas, while a prisoner of war on May 9, 1864.